How many times can you think of when it would be convenient – not to mention downright impressive and just plain cool – to serve fruit hand pies instead of your usual slice of fruit pie? How about in bag lunches? Or at tailgate parties? On the boat, a hike, at the beach, or for an after school snack? Wouldn’t be hard to come up with a dozen other examples now, would it? 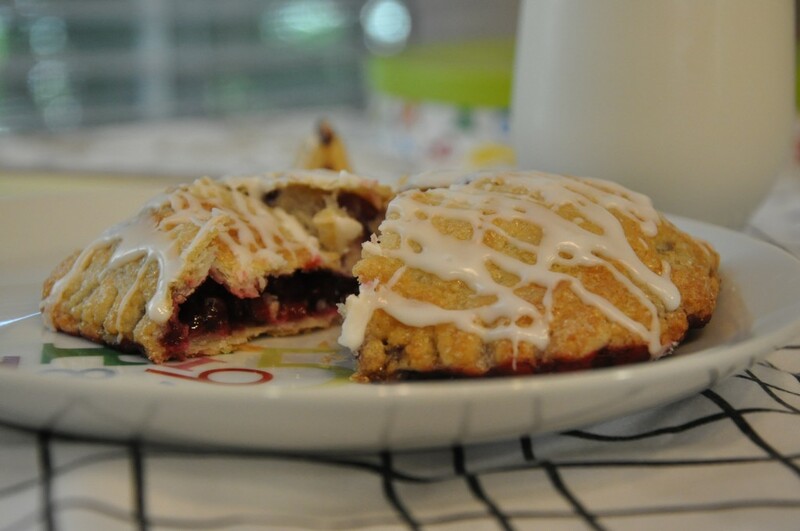 Which is why I’ve spent the last couple of weeks fiddling around with hand pies here at The Pie Academy: because hand pies (or turnovers, if you prefer the name) is an idea whose time has come and discovered a wide and appreciative following in the ranks of home cooks. What’s not to love? Hand pies are portable. They’re every bit as delicious as “regular” fruit pie. And being self-contained, as it were, one can nibble away as they please and tuck away the uneaten portion for later, with little fuss or muss. Intrigued? Sure you are. So watch the video above…see how it’s done…then give it a whirl in your own kitchen. You’ll be on to something really good, I promise. *There’s enough pastry here to make 8 good size hand pies. However, some may prefer to make 10 or even 12 smaller ones. Divide the dough and filling accordingly. *Avoid using a dark black baking sheet if possible, which may cause the bottoms of the hand pies to scorch. *Despite your best intentions, some of the filling may leak out onto your baking sheets. This is one instance where parchment paper is highly desirable. Prepare the FOOD PROCESSOR HAND PIE DOUGH as directed. Turn it out onto a lightly floured surface and divide into 8 equal pieces. Shape into balls. Flatten each ball into a slightly oblong disk about 1/3-inch thick. Wrap the disks individually, in plastic wrap. Refrigerate the disks at least 4 hours or overnight. Prepare the FILLING: In a large saucepan, combine the 3 to 3 1/2 cup berries, sugar, lemon juice, and orange juice. Gradually increase the heat and bring to a simmer. Simmer for 3 to 4 minutes, until good and juicy. As the fruit simmers, combine the 2 tablespoons water and cornstarch in a small bowl; blend well with a spoon. Once the fruit has simmered, stir in the cornstarch mixture. Increase the heat and - when the fruit comes to a boil - boil for 60 seconds, stirring nonstop. Remove from the heat and transfer to a bowl. Stir in the ginger, if using. Cool the fruit thoroughly, uncovered. When the fruit has cooled, cover with plastic wrap and refrigerate overnight. The next day, stir in the 1 cup additional berries. Refrigerate until needed. Assemble the hand pies: working with one piece of dough at a time on a lightly floured surface, roll the dough into an oblong-rectangle that's more or less 7-inches long, 4 1/2- to 5-inches wide, and a fat 1/8-inch thick. Using a wet fingertip, moisten the perimeter of the dough. Draw an imaginary line across the center of the dough, widthwise, and place about 1/4 cup of filling just in front of that line, leaving a 3/4-inch border of dough around the filling. Without stretching the dough, fold the uncovered portion of dough over the filling, line up the edges, and press to seal. Using a fork, crimp the edge of the dough. Place on a baking sheet and refrigerate for 30 minutes or freeze for 15 minutes; longer is fine. Repeat for the remaining hand pies. Adjust your oven rack so it is one position above center. Preheat the oven to 375°. Get out 2 large baking sheets and line them with parchment paper, if you have it. If you're not using parchment, there's plenty of fat in the dough so no need to butter your baking sheets. Remove 4 of the hand pies from the freezer and place on one of the baking sheets, evenly spaced. Poke 2 holes in the top of each one with a paring knife, twisting the point of the knife to expand the holes. Brush the hand pies lightly with the egg wash, then sprinkle them generously with sugar. Bake the pies for about 25 minutes, until golden brown, turning the sheet 180° (front to back) about midway through the baking. When done, they'll be golden brown and crusty. (If they start to brown too quickly, move them down to a lower rack.) Transfer the sheet to a rack, to cool. If any of the filling has spilled onto the sheet, transfer the pies to another parchment or wax paper lined rack to finish cooling. Otherwise, they'll stick. Repeat for the remaining 4 pies, baking them on the unused sheet. 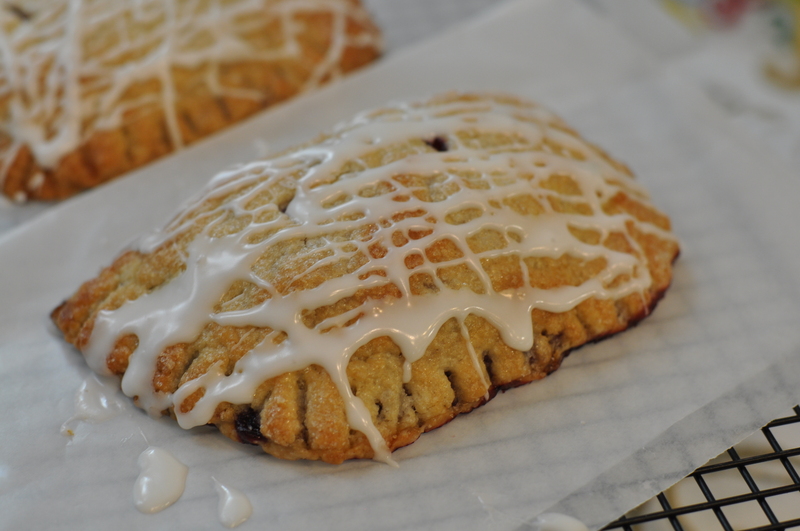 Once they've cooled completely, glaze the hand pies. To make the glaze, put the sifted confectioners' sugar in a large bowl. Add the corn syrup and 1 tablespoon of the milk. Stir or whisk well. Gradually whisk in additional milk - no more than about 1/4 teaspoon at a time - to make a glaze that is thickish but flows easily. Whisk in a few drops of lemon extract, to taste, if using. Drizzle the glaze over the pies, as desired. If storing overnight or longer, wrap the pies individually in foil, taking care not to press down on the glaze. Transfer to a plastic bag and refrigerate. Spread the cut butter and Crisco on a plate and place in the freezer for 15 minutes. Meanwhile, combine the flour, confectioners' sugar, and salt in the bowl of a food processor; pulse several times, to mix. When the butter and Crisco have chilled, add them to the processor. *Pulse the machine repeatedly, perhaps, 8 to 10 times, until the fat is broken into very small pieces. Remove the lid and carefully "fluff" the mixture with a fork, to loosen it. Sprinkle 4 tablespoons cold water over the top. Pulse the machine 4 or 5 times, to incorporate this first bit of water. Remove the lid and "fluff" the mixture again. Add the remaining water through the feed tube, in a 6- to 7- second stream, pulsing the machine as you add it. Continue to pulse until the dough pulls together in large clumps, but has not balled up around the blade. Turn the dough out onto a lightly floured surface. Using floured hands, pack it together and knead gently 2 or 3 times. Shape and refrigerate as directed. Makes enough pastry for 8 good size hand pies. *When I say "pulse" I'm referring to a quick, one-second-long event. It's simply a quick on-then-off burst.